For dinner with the speaker at Manhattanville College prior to the lecture RSVP to Peter Feinman, feinmanp@ihare.org or 914-939-9071. This lecture describes the results of a research and teaching archaeological excavation of a wonderful 13th century Dominican friary in the medieval town of Trim, in the heart of the Boyne Valley in Ireland. 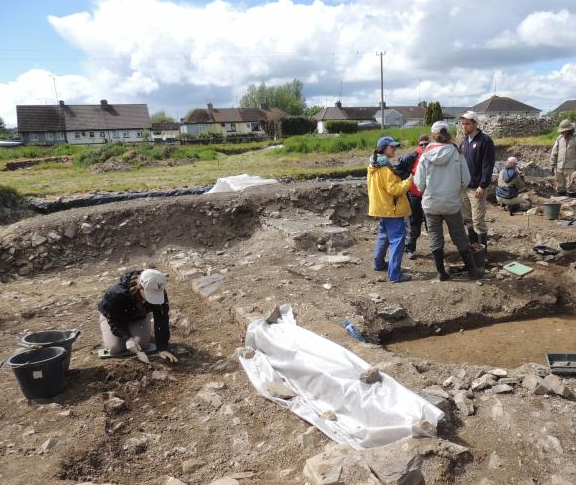 The excavations are revealing incredible stories of the medieval history of Trim, and of the monks who lived, prayer and were buried in the friary. The excavations are only part of the story though, as the lecture will demonstrate the value of engaging the local community in seeing their past as an amenity for the enjoyment of all and worthy of preservation for generations to come. The Blackfriary Community Heritage & Archaeology Project (BCHAP) is an initiative of the Irish Archaeology Field School (http://iafs.ie) and Cultural Tourism Ireland (http://culturaltourismireland.ie),working in partnership with the local community, local government authorities and local businesses. The project is a pilot for a model called CHAT (Cultural Heritage Amenity Towns) that aims to use Ireland’s greatest assets, its culture and its people, to build cultural heritage and amenity projects. CHAT aims to provide a new vehicle for an innovative and sustainable tourism and education based economy founded on engagement by local communities with their heritage. There are numerous small towns in Ireland that have heritage at their core. However, heritage areas in many of our historic towns remain at best under utilized, at worst derelict, due to a combination of factors such as a lack of resources and a diminished sense of ownership of them. This model is different to other initiatives in that it places the project (in this case BCHAP) at the center of the effort to utilize heritage as a wonderful resource to its potential; the process is an exploitable resource, not a means to an end. The Black Friary is located on the northern side of the River Boyne in the town of Trim, Co. Meath. The site, which is in the ownership of the Meath County Council, is located within a field of about 2.5 hectares (c. 6 acres) bounded on all sides by houses and to the southwest by a supermarket. Despite centuries of neglect, the ruins of the friary remain largely intact below the current surface where they are marked by a series of hummocks. Unfortunately, prior to the intervention of the project partners from 2010, the site at Black Friary had become a wasteland, overgrown and unsightly and the focus of anti-social behavior and illegal dumping. The challenge is to ensure the preservation of the archaeological and architectural remains as a legacy for the enjoyment of the local community for generations to come. This was an outstanding program. In particular, the way the Field School is introducing archaeology to school children, college students and the Trim community is really excellent. Hopefully this will help to develop more appreciation for the past and more interest in visiting historical sites.